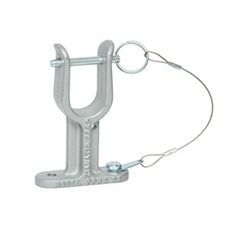 Dickie bracket - painted: Zico Pike Pole holders can be used with most pike poles, closet hooks, and similar round handled tools. Holders are made of cast aluminum with a polyurethane coating or chrome plating to protect your tools and provide years of maintenance-free service. PPMB-DS has cables and pins to hold tools securely. Holders are sold as individual pieces. Two holders are required for all tools. Single tool holders - Parts A and C normally used on handle with the head fitting into parts B, D or DS. Two part C's may be used on closet hooks or other poles having a "D" handle on one end and a pike pole on the other end. Opening width for PPMB-DS is 1-1/8"